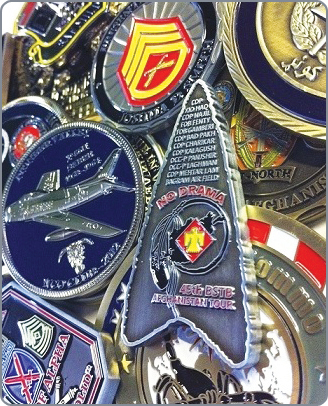 We manufacture the highest quality custom challenge coins, at the lowest price available. If you want a cost effective way to honor the member of your team, then you’ve come to the right place. Using your logo, military insignia, or just about anything you can think of, we design a unique challenge coin anyone would be happy to receive. Need help with the process? Call us at 1-800-818-3229 and a representative will be pleased to assist you. By distributing your own custom challenge coins to your staff, you build up an incredibly strong bond that money can’t buy, and one the military has been using for decades. Every one of your employees or unit members will be thrilled to receive such a beautiful keepsake. Military coins have a deep seeded significance in many military groups reaching back over half a century in history. Some would argue that these custom coins date back to even before the colonization of North America. Such coins have evolved into prized recognition and unity pieces, collected and carried by members of the armed forces spanning the globe. In modern times, challenge coins aren’t just used by the Armed Forces; they are also used in business to inspire a military style brotherhood and camaraderie between teammates. They are a fantastic way to honor a valued member of your team. Law Enforcement coins have caught on as well, and nothing will reward the loyalty and strength of a respected employee or officer like a distinguished and personalized custom coin. We haven’t forgotten about the other group that puts their lives on the line every day, either. Fire Departments have also joined in on the tradition and are among the single largest purchasers. It is no wonder why some of the most creative designs are found on Firefighter Challenge Coins. From simple to complex 3D designs, we have the skills to make a coin you can cherish and display at your local FD for generations to come. As military commanders learned, a challenge coin is also a fantastic way to build a sense of brotherhood between teammates. If you’d like your team to have all the fellowship and affiliation to each other of a tightly drilled military unit, then custom military coins are an incredibly effective way to inspire that spirit. Check our Common Questions & Straightforward Answers page for complete information about ordering. Custom military coins are a symbol of loyalty that are highly prized. They have significant perceived value, and that’s why they are so revered to signify the kind of honor towards a team or group that people are proud to keep and display forever. And yes…some military units really do carry them around wherever they go. We are pleased to offer our customers both common types of coins, soft and hard enamel. In fact, we will thoroughly explain the smooth surface appearance of a hard enamel coin upon request…simply ask, and we’ll provide continued outstanding service. If you’ve never learned about what makes each type different, read Soft Enamel or Hard Enamel Coins – Which is Better? Challenge coins help you honor the achievements of members of your team or group in a unique and lasting way. With custom challenge coins that incorporate your logo, military insignia and other elements, you’re free to use your creativity to design a challenge coin for every occasion. Challenge Coins Ltd. is proud to offer custom challenge coins that are manufactured to high standards of quality, but available at the lowest price possible. So we give you a cost effective way to honor your team members and commemorate their achievements — but our challenge coins look anything but cost-conscious! We offer not only challenge coins for military groups, but also corporate challenge coins you can use to motivate and honor your staff members, impress your clients and build relationships, or reward your suppliers for their efficiency and dependability. A challenge coin is a beautiful keepsake that is truly one of a kind, and will be treasured for years to come. Law enforcement and fire departments can also benefit from custom challenge coins. Reward loyalty, recognize courage, honor sacrifices made — challenge coins are perfect for any of these uses and more. The use of military challenge coins goes back at least half a century, and some say all the way back to colonial times. The reason challenge coins have stood the test of time is that they really do work as a way to build camaraderie and team loyalty. Whatever your challenge coin design idea may be, we have the experience and skills to create anything from simple designs to more complex 3D designs, and we offer both of the most common types of challenge coins: soft enamel and hard enamel. Need help choosing a coin type or designing your custom coins? Call us at 1-800-818-3229 and a representative will be pleased to help you design a challenge coin that perfectly expresses your group’s values and recognizes excellence.